Surveyors discovered that the hill was actually 3ft taller than initially thought. Cumbria Police have been forced to rescue a group of hikers from a mountain who were unable to walk after consuming cannabis. 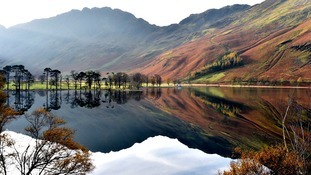 England's largest National Park has been awarded Unesco World Heritage Site status. 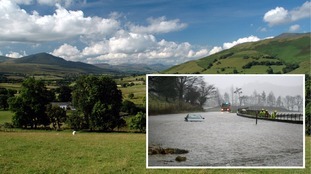 Hundreds of trees are to be sown by more than 90 people to restore woodlands after Storm Desmond in the Lake District. Local people said they are worried about the future of farming in the area after the Trust bought three hundred acres in Borrowdale. Residents in Grasmere and Keswick celebrated the reopening of the A591, the main road that brings tourists to their towns in Cumbria. A man and woman have died following an explosion at a lakeside wedding celebration. It is thought the two casualties may be firework technicians who had been booked to stage an evening display at a luxury property in Ecclerigg, Cumbria, off the shore of Lake Windermere. They had joined around 70 guests who had gathered to mark the wedding of local insurance boss John Simpson and his partner, Nicole Rothwell. Witnesses and neighbours spoke of an "almighty bang" at about 3.15pm yesterday followed by a series of "smaller bangs and pops". A shed containing the fireworks erupted into flames and spread to another outbuilding and a parked car nearby. A spokesman for Cumbria Constabulary said: "Police and the fire service are investigating the circumstances that led to the fire." Follow this story on the ITV News Border website. Mountain rescue volunteers wasted hours searching for a family who called for help, saying they were stuck at the peak of England's highest mountain - but who then climbed down unaided. A man called Wasdale Mountain Rescue Team to ask for help, saying he, his wife and his son were trapped on Scafell Pike in the Lake District. With weather conditions getting worse and the family not answering their phone, the rescue team began to comb the mountainside for the trio to bring them back down to safety. Eventually, the family answered the phone at around 9.40pm - more than six hours after the first call - and told rescuers they had managed to climb down after all, and "didn't realise" they should notify the emergency services. A spokeswoman for Cumbria Police urged walkers to only call for help if it is needed - and cancel it if it becomes no longer necessary. By not informing us there is a drain on resources and potentially could hinder someone who does need urgent help. All we request is for people to be considerate. A Lake District mountain has been put up for sale as its owner attempts to pay off a hefty tax bill. Blencathra, a 2,850ft (868m) high peak known as Saddleback, has been placed on the market for £1.75 million. The Earl of Lonsdale, Hugh Lowther, is trying to sell the 2,676 acre plot to help pay off the reported £9 million tax he owes from his father's inheritance. "My family have owned Blencathra and its Manor for over 400 years, so the sale of this iconic property will be a great loss," he said. "However, we need to realise capital for Inheritance Tax following the death of my father in 2006 and our aim is to retain the core portions of the Lonsdale Estates intact as far as is possible." The buyer will obtain grazing rights for 5,471 ewes, 732 hoggs, 200 lambs and also be entitled to use the title Lord of the Manor of Threlkeld. A man has been killed in a 656ft (200m) fall down a mountain in the Lake District on Friday, a rescue team said. The 24-year-old was walking with a companion on Helvellyn when the incident happened. According to Patterdale Mountain Rescue Team, he fell from Striding Edge into Nethermost Cove. His walking partner found him unconscious and, because there was no mobile phone signal, he continued his descent into Grisedale where a local farmer gave him a lift to Patterdale so he could raise the alarm. An RAF Sea King helicopter, the Great North Air Ambulance, search and rescue dogs and mountain rescue teams from Patterdale and Penrith combined to search for the man, but he was found to have suffered fatal injuries.